This boat is in excellent condition. With less than 98 hours on it, it is like a new boat. The only blemish on the entire boat is one small crack in the read seat upholstery. The rest of the boat is in great shape. The seller had a major service performed on the boat last summer for $5000. 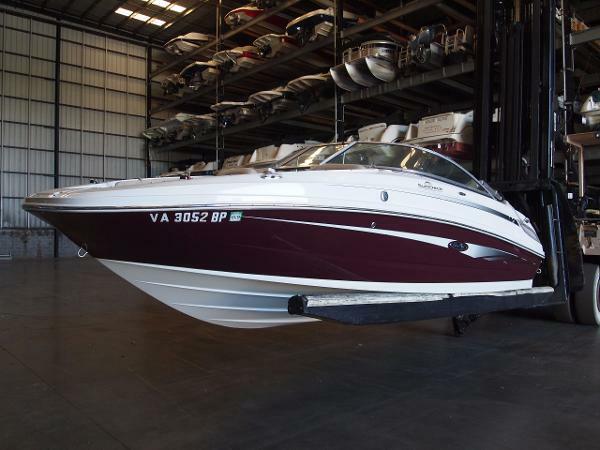 The receipt for the work is in the photos Stock #170103 Extra Clean 2007 Sea Ray 220 SunDeck. One Owner, Only 98 hours, Trailer Included! 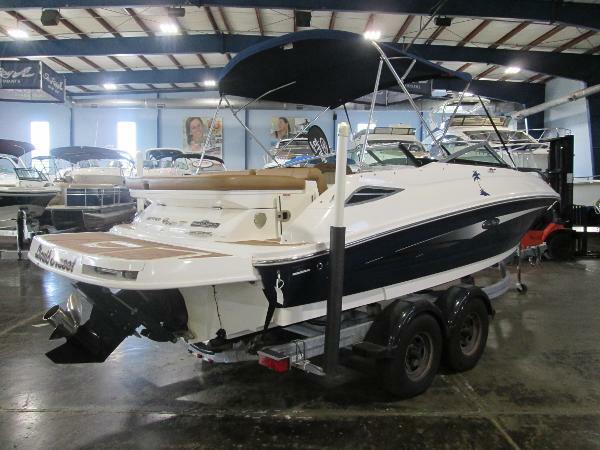 If you are in the market for a deck boat, look no further than this 2007 Sea Ray 220 Sundeck, just reduced to $28,500 (offers encouraged). 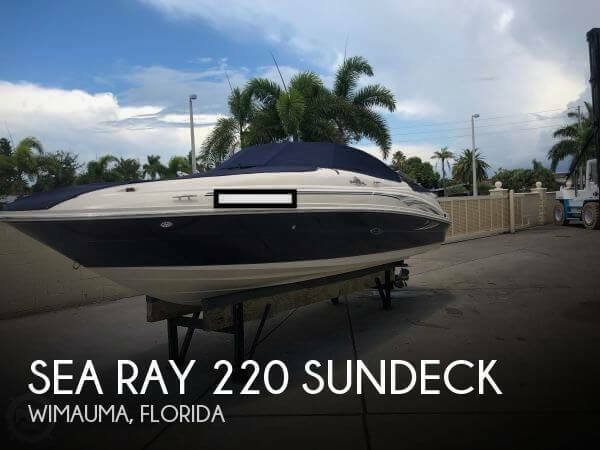 This boat is located in Port Saint Lucie, Florida and is in great condition. She is also equipped with a Mercruiser engine that has only 98 hours. Reason for selling is no longer using. Stored at High and Dry. 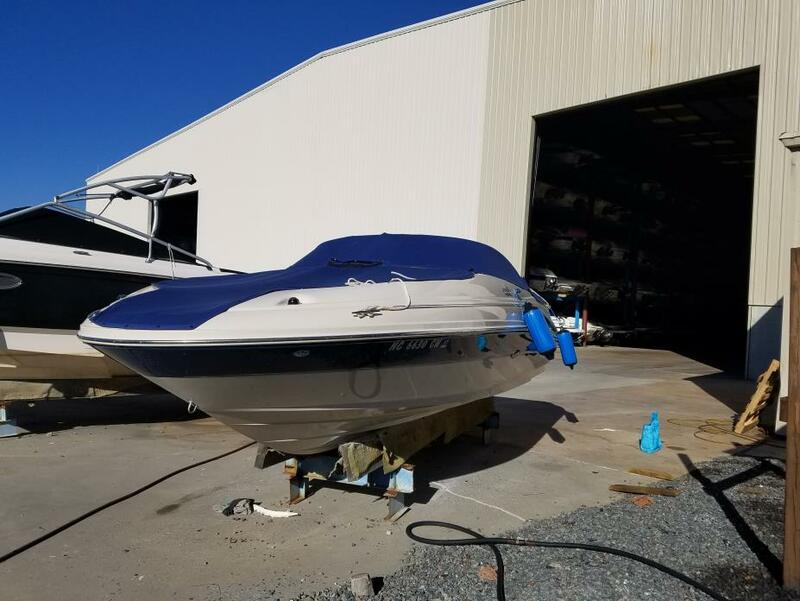 Seller states that everything on the boat works as expected and that she is mechanically sound and ready for any inspections you desire. A sweet unit that will not last long! Please make an inquiry or call for more information, to set a showing or make an offer! 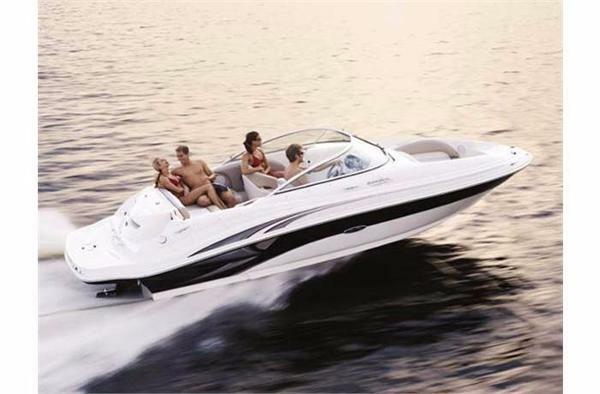 Stock #162537 Versatile Family and Friends Fun Boat, Super Low Hours. Kept High & Dry By Meticulous Owner! 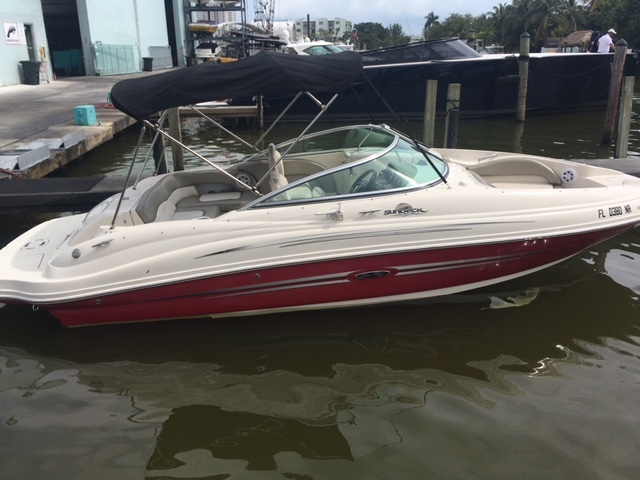 If you are in the market for a deck boat, look no further than this 2005 Sea Ray 220 Sundeck, priced right at $26,700 (offers encouraged). 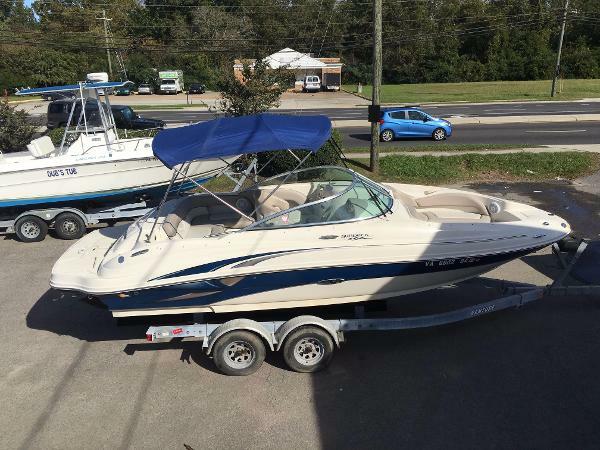 This boat is located in Wimauma, Florida and is in great condition. She is also equipped with a Mercruiser engine that has only 97 hours. 2006 Sea Ray 220 Sundeck Good times just keep getting better. The Sea Ray 220 Sundeck boasts a huge bow eating area big enough for family and friends, plus an expanded entertainment center with sink and fully enclosed fiberglass head. Additional features include a portside bucket seat that converts to a sun lounger and satellite-radio stereo with weatherproof speakers. 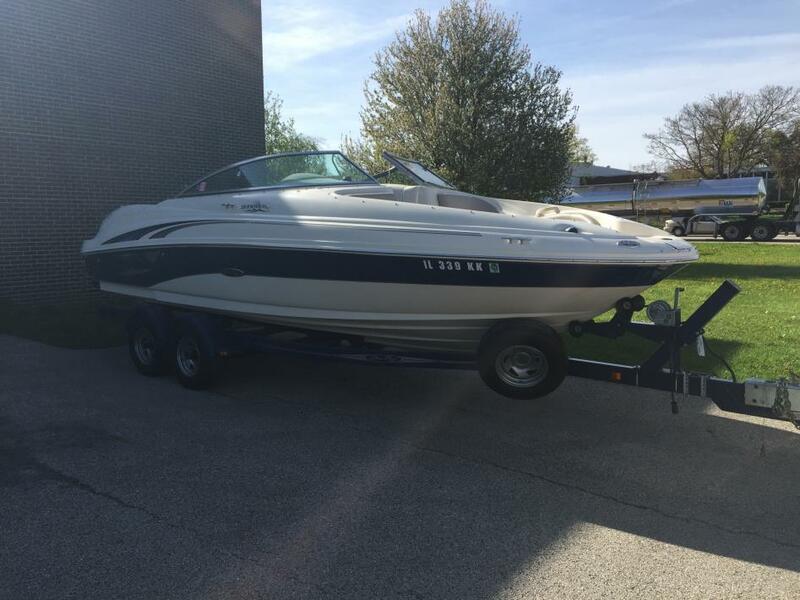 2007 Sea Ray 220 Sundeck If your looking for a great boat to cruise around, ski, spend time with family and friends, this is the perfect boat for you. Dry docked in Miami Beach with only 250 hours on the engine. Upgrades unclude JL audio Speakers, Kenwood subwofer, Lowrance GPS and Cobra marine radio. 2010 Sea Ray 220 Sundeck Beautiful Sea Ray 220 Sundeck with Mercruiser 350 MAG MPI, bimini top w/enclosure, VHF radio, indirect cockpit lighting, twin helm seats w/ flip-up bolsters, cockpit table, bow beach boarding ladder, pump-out head, dual batteries w/switch, fire suppression system, transom trim switch, flag pole & base, Includes Sea Ray galvanized trailer tandem axle w/brakes. 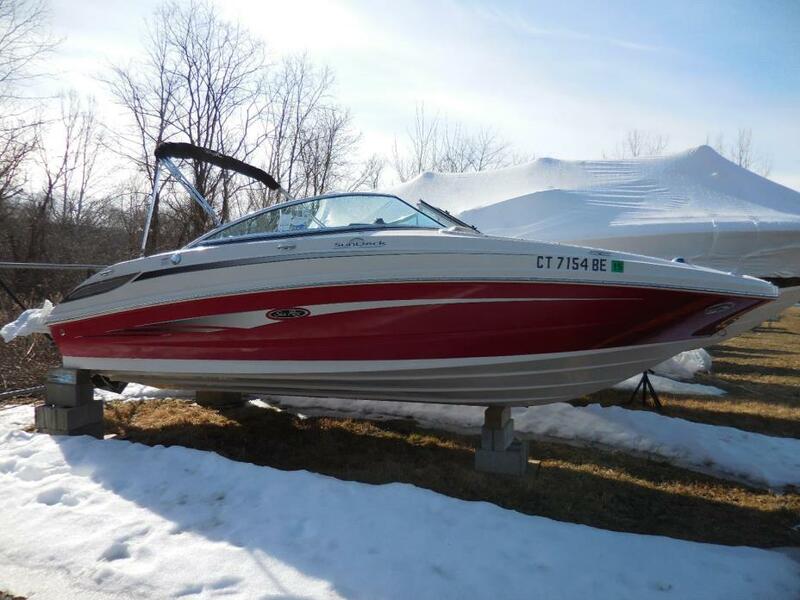 This is the best 220 Sundeck available - meticulously kept, professionally maintained, original owners, freshwater use only, kept in a boatel everything youre looking for. 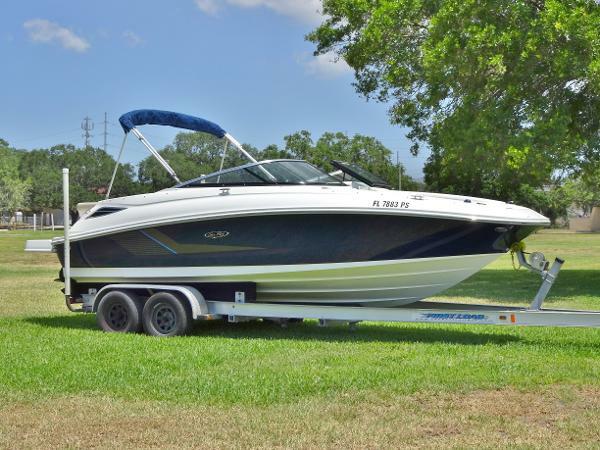 2005 Sea Ray 220 Sundeck The Sea Ray Sundeck 220 is a great family fun boat for day trips, water skiing, wake boarding, tubing or just relaxing with friends. Ample room with seating to accommodate your guests and family to entertain. Powered by the Mercruiser 5.0 MPI 260 HP stern drive which has been yard maintain and serviced. 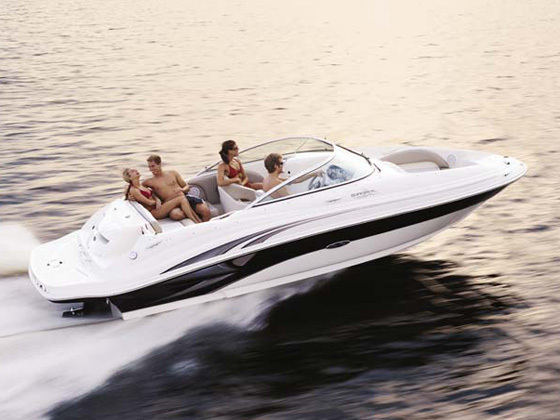 2014 Sea Ray 220 Sundeck Our commitment to building the best boats demands constant improvement. Case in point: the new folding tower option with removable bimini on our 220 Sundeck. It joins a standard convertible transom seat/sun pad, wet bar and enclosed head compartment. Key Features Available in black, red, blue, burgundy, and patina two-tone or full hull color optional gel-coat finishes with Sundeck® graphics Easy-to-access transom with wakeboard/ski storage. Limited Lifetime Structural Warranty on hull and deck. Matching tandem-axle trailer with surge brakes and swing-away tongue. Swim Platform w/Faux Teak Inserts Mercury Installation Quality Certification - standard 2-year limited engine warranty. SmartCraft® systems standard. 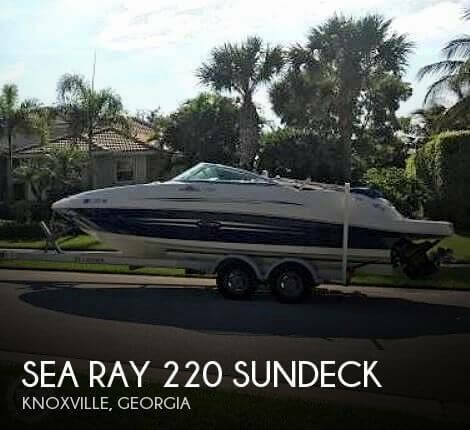 2004 Sea Ray 220 Sundeck Clean, well maintained Sea Ray 220 Sundeck! Great first boat. Mercruiser 5.0L 260 HP with ~380 hours. Built in swim platform and fold down ladder. Dual battery set up. New snap in carpets. Sunbrella bimini top with cover. Single owner, dry stored 100% of the time at Lake Norman. Winterized every year. Bow and cockpit boat covers with storage bag. Stereo with CD player, remote access to the stereo from swim platform. 50 gallon gas tank; 10 gallon water storage. Removable Head, but never been used; can be pumped out from the side of the boat. Two stowable tables. Four fenders. Filler Cushions for sunpad in the bow. Anchor with chain. No trailer. 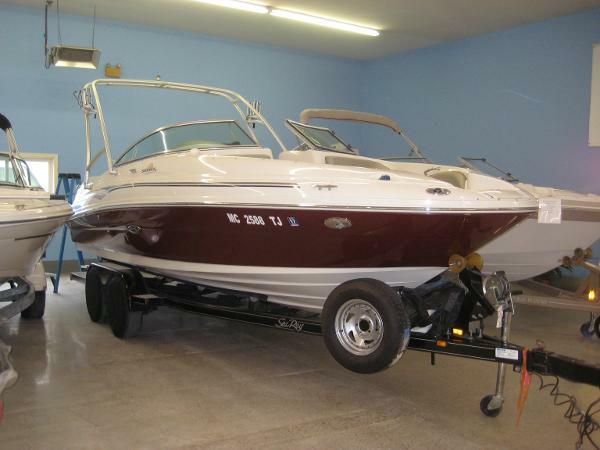 2003 Sea Ray 220 Sundeck This boat is in fantastic condition. All of the upholstery is in great condition and looks like new. The boat includes a remanufactured Mercruiser 5.0 (Multi port fuel injection) V-8 with a Dual Prop Bravo 3 Outdrive. A New Venture VATB-5925 Aluminum I-beam Trailer is included as well. Engine includes 18 month warranty. From its integral swim platform to gelcoat and custom graphics packages, the Sea Ray 220 Sundeck is just the ticket for a refreshing getaway on the bay. 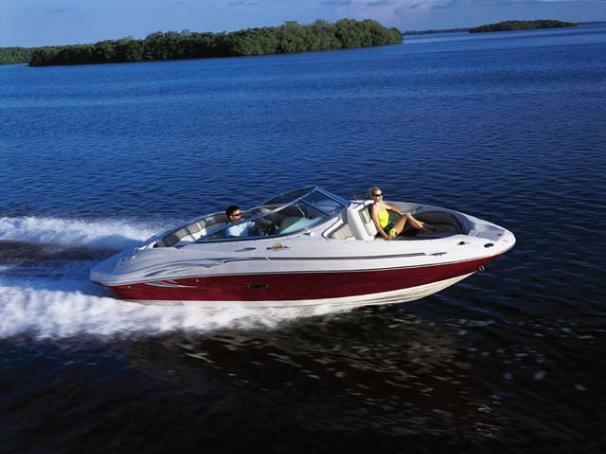 In addition to unmatched style, performance and handling, boaters will enjoy many of the features normally reserved for larger Sea Rays. With its 260-horsepower 5.0L MPI Alpha I MCM stern drive, the powerful 220 Sundeck will take passengers wherever they want to go.